In the last week of Term 3 the Wentworth Sailing squad attended a regatta in Algies Bay in the 420 racing dinghies. The captain of the team, Cameron Hughes, was ill so new combinations had to be sorted. The 3 skippers were Liam Herbert, Sean Herbert and Oliver Reeves, and the 3 crew were Mel Hopkins, Sam Haggerty and Kip Simpson. This was the first time that Oliver had skippered at a regatta and the first regatta for both Sam and Kip, so it was all very exciting! Strong winds on the first day meant that racing was cancelled and our students returned to school and their classes. The next two days the sailors sailed race after race, even taking lunch on the water. They worked very hard and the experienced skippers of Liam and Sean directed their teams to many wins. Everybody learnt more sailing rules and can be proud of their efforts of second place overall. This was an excellent regatta and well done to all. 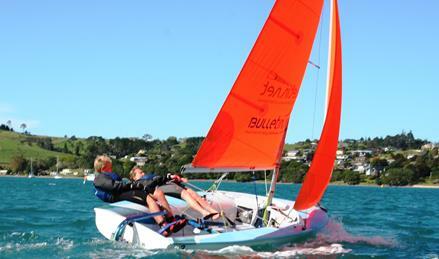 Wentworth sailors are now looking forward to the next regatta at Keri Keri in December.